Every seat in the Virginia General Assembly will be on the ballot Tuesday when residents head to the polls. Not that you'd necessarily know that. But this election matters -- possibly more than you think it does. So here are four things you need to know about the Nov. 3 election. Some basics: Polls will be open from 6 a.m. until 7 p.m. Click here to find your polling location. Voters in Virginia are required to show a photo ID to vote, but that ID does not have to show the voter's address. While Republicans are expected to maintain control in the House of Delegates, the Democrats only need to pick up one seat to gain control of the Senate. Right now, Republicans have 21 seats to the Democrats' 19. Democrats believe they will pick up a seat in the Richmond area, where Chesterfield Supervisor Dan Gecker (D) faces Glen Sturtevant (R). But District 29 in Prince William County is also considered a competitive race. If Democratic candidate Jeremy McPike wins the seat, the Democrats could regain control. If both parties end up with 20 seats, Lt. Gov. Ralph Northam (D) will cast the tie-breaking vote. While there are some competitive races, many voters will not see many options on their ballot. In the state Senate, 22 out of 40 races have more than one candidate, but only six are expected to be close. In the House, only 38 out of 100 have two or more candidates, with only a handful expected to be competitive. The chief architect of the 2011 Republican legislative redistricting plan testified in federal court earlier this year that raw political self-interest was at work when the maps were being drawn. Del. S. Chris Jones testified that he tried to accommodate requests from 75 to 80 delegates who sought to tweak lines, sometimes to draw out precincts where they had historically performed poorly or to draw out a potential primary challenger. But those requests were made by Republicans and Democrats alike, and GOP lawmakers dispute that the current map is squelching competition. Low voter turnout has led to some surprising upsets in years past. Last year, Eric Cantor's defeat to Tea Party candidate Dave Brat cost the number two House Republican his seat in Congress and left the political world in shock. Locally, Alexandria Mayor Bill Euille blamed low turnout when he lost the Democratic mayoral primary to councilmember Allison Silberberg. Silberberg won by just over 300 votes. "My head's not down," said Euille, a lifelong Alexandria resident. "I'm proud of my accomplishments. Obviously low voter turnout impacted the outcome." Despite losing the mayoral primary, Euille is hoping he will be re-elected Tuesday in a write-in campaign. 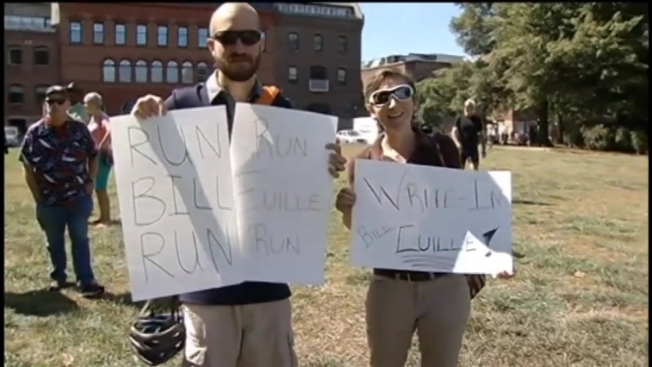 "I will not go quietly into the night," Euille said during an event announcing his campaign. Euille has been mayor since 2003, and had never been opposed prior to this summer. There's no Republican candidate on the ballot.